In this highly informative piece, authors Cynthia L. Dunn, RN, FACMPE and Rosemarie Nelson, MS, healthcare industry leading experts and principal consultants for the MGMA Health Care Consulting Group (www. 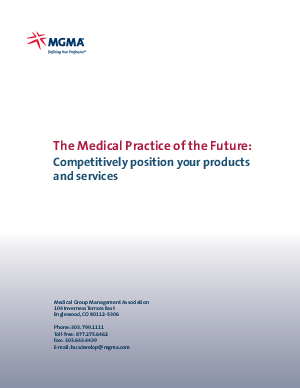 mgma.com/consulting) have composed an in-depth look at the medical practice of the future that will allow you to learn about: 1. What drives medical practices? What are they looking for in terms of functionality, quality, quantity, etc. of your products and services? 2. The coming healthcare changes that will impact medical practices significantly and create new marketing opportunities and markets for your products and services. 3. The top 10 things marketers need to know about marketing to medical practices. Download this paper and find out more about the healthcare industry and a market that is considered one of the healthiest growth markets in the US today.